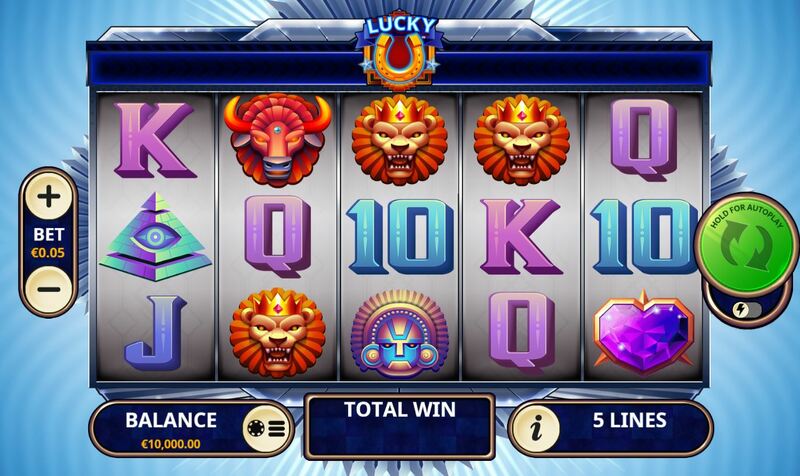 Lucky U slot by Playtech win your feature trigger pay over and over! 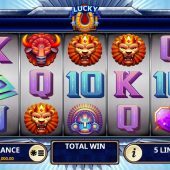 Lucky U slot by Playtech looks very mundane upon opening with plain grey reels over a light blue patterned background and some cheesy pop music tune playing from the outset and alas enduring all throughout your game play too. The U is a simple reference to the horseshoe sitting above the centre reel which by the way means absolutely nothing. The fact we have only 5 lines suggests some potential here though, that you usually expect from fewer lines and Merkur tend to specialize in this mechanic with slots such as Blazing Star, Knight's Life and Vampires. So will Lucky U slot be lucky for you, or more importantly your bankroll? So we know already we only get 5 paying lines on Lucky U slot and they only pay left-to-right as well. The symbols are single and the 5-of-a-kinds are naturally quite substantial with Purple Hearts paying 100x bet, Buffalo 40x, Inca Mask or Lion Mask 20x with a Pyramid containing the all-seeing eye plus six card values all paying 20x too! There is a Wild Star on reels 2,3 and 4 and all reels contained stacked Horseshoes which act as the game's scatter. You need to land 6 or more Horseshoes anywhere in view to trigger 5 free games. You'll see bet multiples on them between 1 and 50x bet. When triggering the combined values are paid and then stored at the top of the reels in the Horseshoe. This is a repeating prize as although there is no retrigger possible, each Star Wild appearing in the free games awards one extra spin plus a repeat of the total you triggered with. Line pays just add as normal and are not involved in the repeating amount. So for example you had 20x bet trigger in the bank and landed all 3 Wilds, you would win 60x bet on top and add 3 extra spins.